Summer is Coming! Walk to The Hangout! Affordable Vacation for Family! Thank you for spending a few moments looking at our condo. We are located in the heart of Gulf Shores and convenient to everything. Our condo is directly across the street from the beach and once you walk out the front door you are standing on the beach in 4 minutes. It's a great thing to save money on the rental rate and have more left for eating, shopping, playing and sightseeing. You are using the same beach, same restaurants, same stores, same activities as all the folks in the expensive high rise condos. Why not save. Enjoy the mornings and evenings on our balcony. That first cup of coffee in the morning is soooo good. Especially when you are on vacation and not heading out to work! 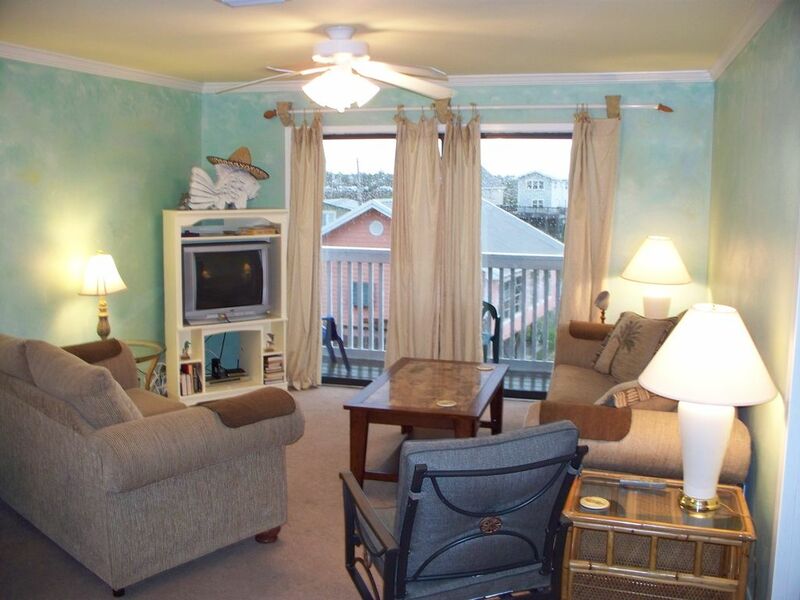 The condo is outfitted with nearly everything you will need while you are here. We don't want you to have to bring your whole house down to spend a week. We have wifi internet in the condo so bring your laptop too. If you like to walk be sure to walk on the beach about 3/4 mile to the new pier in Gulf Shores. It is 1500' long and is quite a sight when you walk out to the end. There is a nominal charge for walking out to the end of the pier and fishing is permitted with a temporary license. If you like to walk or run we have wide walking and bike lanes on Beach Blvd for your safety. You can walk to a number of restaurants that are from 1/10th to 3/8 of a mile from the condo. Shops are close also for walking to. Overall we were very pleased with our stay. The place is a little out of date but was clean and comfortable. Would gladly stay again. Great location close to everything!!! Affordable cozy place right by the beach! This condo was amazing! It is located directly across the street from the beach, about a 3 minute walk. Great location easy access to amenities. Clean condo and had everything you needed to cook and prepare meals. The owner was very easy to communicate with! We had a great time staying in this condo. All rooms were clean and equipped with every thing we needed along with extra blankets. Bathroom was nice (great shower head); We didn't cook during our stay, but kitchen looked to have everything a person could need; Living room was very comfortable; Nice TVs in all 3 rooms; Balcony was nice, equipped with furniture. Condo was on 3rd floor but you get the closest parking to the stairs. Parking for 2. Owner was very nice and answered every question we had along with offering additional information. We were quick to get into the condo & check out was very simple. We walked from the condo down to beach & "The Hang Out" one time, other than that we left our beach chairs in vehicle and drove to it. We were down for spring break & always found great public parking near the beach ($5 a day public parking)... Definitely hope to visit again soon. Sign the guest book! :) **Which by the way we flipped through & there were great reviews and thank you's from other families. THANKS AGAIN OWNERS! Our young renters didn't know that our access to the beach was directly across the street from us. We show in our rental guidelines how to walk straight over to the beach. It takes 3 minutes from the front door to be standing on the beach. You leave your vehicle under our building in your assigned parking space and safely cross over with the traffic light right on our corner.